Of course, he wanted to go to court and expose her for the bad person she was and get divorced as soon as possible. I had the unpleasant task of explaining to him that, in his situation, he would probably spend a lot of money and get very little satisfaction from doing this. He was not a happy camper, but I had to explain to him the truth about what a court could and could not do. If you are thinking about going to court to win custody of your children or to prove your spouse is a terrible person, think again. If you have a lawyer telling you that going to court is your only option, question your lawyer or get a second opinion. It’s time to “get real” about the impact litigation has on families. Clients typically believe that getting divorced means getting ugly with each other and having to go to court to get things settled. This is not true. There are a number of ways to get divorced without going to court (and without getting ugly), ways that are better for everyone involved. And there are a number of compelling reasons why you want going to court to be a last resort for you. Yes, there are cases when there is no alternative to going to court, but honestly, they are few and far between. 1. 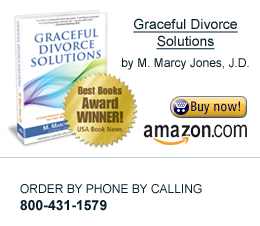 Litigation is the most expensive and least effective way of getting divorced. 2. It destroys family relationships. It’s hard to co-parent after you annihilate your spouse in court. 3. It’s incredibly stressful for the whole family, especially your children. 4. It takes forever! Dockets dictate the pace of your case. 5. No one wins when you go to court. It’s definitely a lose-lose situation. emotional and psychological needs of a family in a divorce situation. When soon to be spouses use the legal system, they are seldom satisfied with the outcome, and this often leads to even more litigation. Most clients get this, regardless of the reasons they have come to this place of getting divorced. They want to maintain some control over how their case goes and to minimize the costs involved. They want to protect their children. They don’t want it to go on for years, and they do (perhaps grudgingly) want the best relationship possible with their spouse going forward for the benefit of their children. How do you do this? Investigate other options like mediation and collaborative divorce. Seek out lawyers who are settlement experts. Think about what you want your life to look like a year from now and five years from now. Think about what you want for your children and for yourself. Get the help you need to figure out how to improve your communication with your spouse, so that, even though your marriage is ending, your relationship continues in the most positive way possible. Going to court to get divorced should be your absolute last resort. For the benefit of you, your spouse, your children, and your bank account, you owe it to yourself to check out these other options. If you are a soon-to-be ex, do your own investigation about this, and make every effort to take the highest road possible in your situation. It isn’t easy, but it’s definitely worth it.